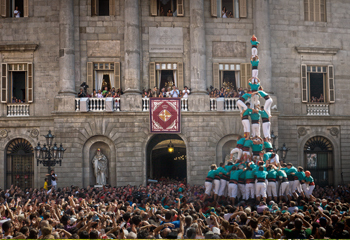 Barcelona is the administrative and cultural capital of Catalonia. The city’s two thousand year history has left its mark in its architectural, artistic and cultural heritage. Its excellent international communications, its Mediterranean climate and its cosmopolitan atmosphere make it a privileged city indeed. 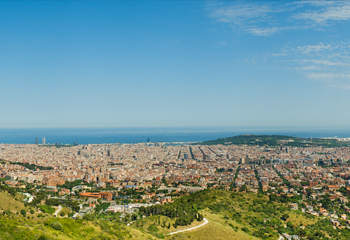 Barcelona, the southernmost port of Europe, has seen how Romans, Arabs, Christians and other civilisations have left their mark. Streets and squares are full of monuments and sculptures, both classic and Mediterranean, evidence of a great passion for art that makes Barcelona an open-air museum. AN OWN LANGUAGE AND CULTURE. If before your arrival you want to make a first approach to our language we recommend you not to hesitate visiting the following links, as it will help you to choose the option which best suits your needs. Consortium for Linguistic Normalisation: To check the different levels where you can register for following the face, distance learning or on-line teaching modalities. The Barri Gòtic (Gothic Quarter), the heart of the Medieval city, was surrounded by ramparts till the middle of the 19th century. Through the maze of the streets you will reach the Cathedral which dates back to the 13th century. Nearby, the Plaça del Rei is the historical quarter centre where the Barcelona History Museum is sited. 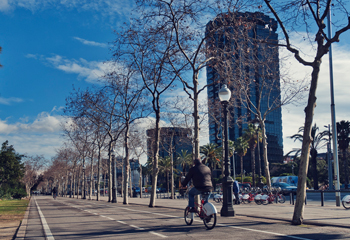 This quarter is the Barcelona’s historical and political centre with the Sant Jaume square, where the Barcelona’s City council and the Palau de la Generalitat, seat of the Catalan Government, are located. The Ribera district is a labyrinth of Medieval streets, such as the famous Carrer Montcada with its noble palaces that reflect the Barcelona’s commercial prosperity between the 13th and 15th centuries. At present, these buildings house different museums, such as the Picasso Museum. At the end of the Carrer Montcada you will find the splendid Gothic church of Santa Maria del Mar. To be highlighted the Palau de la Música Catalana, a magnificent Modernist building designed by the architect Domènech i Montaner. The Born has become one of the most visited districts of the city, giving place to the opening of shops, restaurants, bars and other fashion places that have provided it a new air while keeping its traditional character. Worth mentioning are the Mercat del Born and the Estació de França. La Rambla and the Raval. La Rambla begins in Plaça de Catalunya and continues down to the Mirador de Colom, in the harbour, and passes in front of long-established shops, cafes, the Palau de la Virreina, the Boqueria -the city’s finest market-, the Gran Teatre del Liceu -the city’s opera house-, the Plaça Reial and the Santa Mònica Art Centre. Going down La Rambla towards the sea, on the right-hand side, you will find the Raval district, where the Centre de Cultura Contemporània de Barcelona –the main exhibition centre in the city- and the Museu d’Art Contemporani de Barcelona -Contemporary art museum- are located. Today Barcelona is a city open to the sea. The Reials Drassanes –the former medieval shipyards- reflect the importance of the sea trade and the social life of the Catalan merchant class during the Middle Ages. Nowadays, the building houses the Museu Marítim –maritime museum-. The domed viewing gallery of the Mirador de Colom provides a view of the entire city and its forefront. 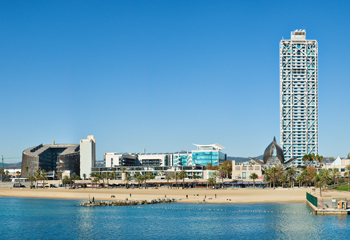 The Rambla de Mar links the Moll de la Fusta with the Moll d’Espanya, where we find the leisure complex of the Maremàgnum, L’Aquàrium –one of Europe’s biggest aquariums- and cinema Imax. 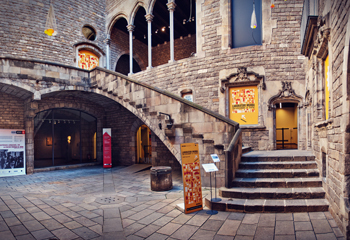 The Palau de Mar is the house of the Museu d’Història de Catalunya -Catalonia History Museum-. The Barceloneta is a traditional sailing and fishing district, which is renowned for its fish and seafood restaurants. You can also spend a day on the beach. The Olympic Village, with the Olympic Port, offers excellent conditions for practicing water sports. 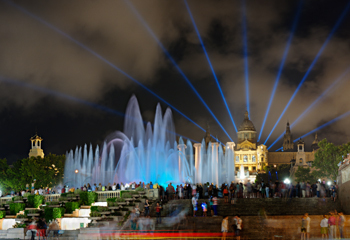 Montjuïc is where the International Exhibition of 1929 and the Olympic Games of 1992 took place. 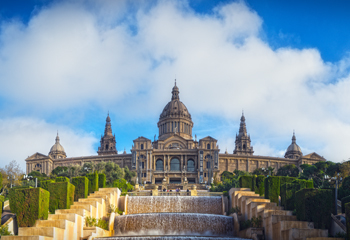 It has important cultural sites (Museu Nacional d’Art de Catalunya -MNAC-, Fundació Joan Miró, Caixa Forum, Teatre Grec, Mercat de les Flors or the Pavilion Mies van der Rohe); sport equipments (Olympic stadium, Palau Sant Jordi or the Picornell swimming pool); and leisure places such as the Poble Espanyol designed to show the Spanish local architecture. The Eixample was the result of Barcelona’s need to spread beyond its city walls, due to the expansion it experienced from 1860. The Eixample, with its tidy and grid-like street layout planned by the engineer Ildefons Cerdà, is no doubt, one of the most unusual civil ingenious creations in Europe. 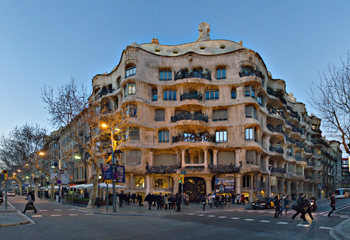 At present, the Eixample is the big centre of the city. It is a shopping and residential area. Its streets house many fashionable shops, art galleries, restaurants and bars and pubs. A walk around the Eixample means to live directly the city’s pulse. In this district, tradition and modernity live side by side in perfect harmony. Some innovative structures such as the Torres Trade stands out against modern offices, housings and hotels. We can also find important shops and department stores. At both sides of the Avinguda Diagonal we find university campuses. You should not miss the chance to visit the Palau Reial de Pedralbes, built for the king Alfons XIII in 1929, and the 14th century Monastery of Pedralbes, which houses the Thyssen-Bornemisza art collection. You can also discover the Futbol Club Barcelona (football team known all over the world) sport facilities –Camp Nou and the Museum- the Polo Club and the Royal Tennis Club of Barcelona. The Tibidabo, the highest point of the Collserola mountain range, as a characteristic backcloth to the city, houses the expiatory Temple of the Sacred Heart, the Fabra Observatory and the communication tower that overlooks Barcelona designed by Norman Foster. 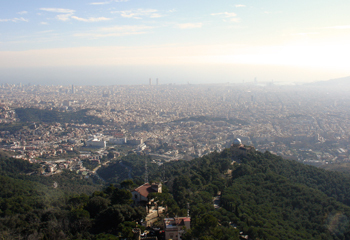 The Collserola Park, the city’s green lung easy to access and that offers a natural beauty, has become an exceptional balcony and an excellent place to follow signposted routes. One of the most famous places in Barcelona is the Tibidabo funfair.